Wavin provides effective solutions for essential daily needs: safe distribution of gas and drinking water, sustainable rainwater and waste-water management, energy-efficient heating and cooling of buildings, and numerous electrical, telecom and industrial applications. Headquartered in Zwolle, The Netherlands, the Wavin Group has over 30 production plants in more than 25 countries and employs around 5,500 people. It generates an annual revenue of approximately EUR1.2 billion. Since 2012 Wavin has been part of the Mexichem Group, the Latin American global leader in piping systems and petrochemical equipment. The supply chain is mainly organized locally, with each country planning and managing its own plants and warehouses. In view of this decentralized organizational structure, Wavin has launched a supply chain management learning program in order to ensure uniform working methods and the same high level of expertise in all countries. A blended learning program is being set up for each supply chain management discipline, starting with demand planning. Wavin’s nine demand planners from all over Europe have since completed this training. The second stage of the learning program is to provide training to the company’s supply planners. Both programs are completely based on the philosophy of The Value Chain Academy, i.e. the best results are achieved through experiential learning and the application of various different learning methods. Therefore, each program includes a number of e-learning modules which can be followed at any time and anywhere, and these are combined with two days of learning in a traditional classroom setting. The program concludes with a practical assignment within Wavin. 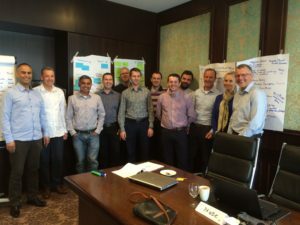 Nine demand planners from nine different countries plus two IT specialists have already completed the Demand Planner learning program. The IT specialists joined the program to gain a better understanding of the business requirements for system changes. The program started with an online assessment in order to give the participants insight into their knowledge gaps, and this information was also useful for the trainer throughout the rest of the program. The kick-off was held as a webinar to minimize travel costs. Over the subsequent four weeks the participants focused on the e-learning modules. Six of the modules covered specific demand planning topics like ‘The process of demand planning’ and ‘Qualitative and quantitative models’, and a further four modules covered soft skills such as ‘Active listening’, ‘How to respond when faced with objections’, etc. The classroom sessions included explanation of general concepts and also case-study work (in groups of three). The second day featured a brainstorm session to agree on the topics for the final phase: the ‘Learning on the Job’ projects. During these projects the participants tackled real-life problems encountered in multiple countries. For example, one project entailed clarifying – and, if necessary, redefining – the definitions behind the ‘alerts’. The trainer was available as a sparring partner during this phase and provided relevant blogs and articles to help and inspire the participants to find effective solutions.